"COAST GUARD RESCUE 21 DEVELOPMENT"
The Coast Guard has multiple duties; the best known is Search and Rescue. 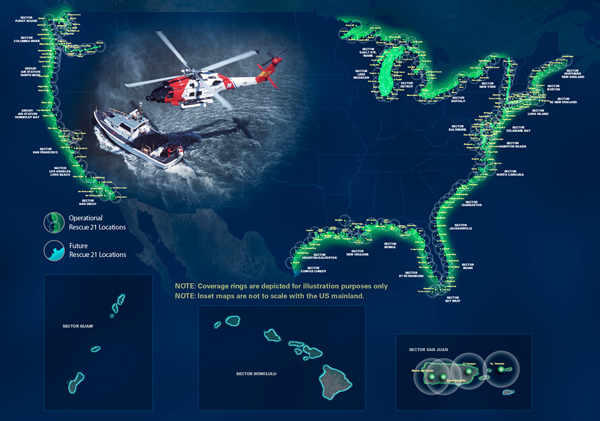 Since its inception, down through the years when people heard “Coast Guard” they immediately thought of rescues. I owned and operated a marine salvage and towing company on the Great Lakes on Lake Huron in Michigan’s Thumb. Many of my cases developed into rescues. Three Coast Guard stations intersected in my location but the port I launched my vessels from was distant from all of them. Therefore, assistance from the Coast Guard, other than radio communications, was a long time and distance away. The area I responded too was along a rocky shoreline, known for its dangerous reefs; some extending over two miles from shore. These reefs, often just below the water’s surface, also jutted into 40 to 50 foot depths and vessels cruising along their edge struck them at a high rate of speed. When my service was required I knew response time was critical to avoid disaster. Many mariners think of a rescue as a simple task. They imagine those performing the rescue receive a call over the radio about a boat in need of assistance and responders just go out and get it. Few people understand the variable circumstances of performing rescues. Prior to the 1970’s, AM marine radios in use experienced what was referred to as skip. This meant the call intended to reach a nearby radio station might actually be received hundreds of miles away. In the 70’s, AM marine radios were replaced with VHF FM marine radios that experienced little or no skips. Although this helped narrow the direction the call originated from, a vast area to search remained. Adding to the difficulty of locating vessels was when emergency (MAYDAY) calls were received; callers unfamiliar with the area they were in could not assist. Loran position locator devices, allowed an FM radio signal to be pinpointed. Time to assist mariners was greatly reduced by the combined use of these remarkable instruments. As the age of electronics continued to advance with the positioning of satellites, GPS (Global Positioning System) was put into use. If a vessel had a GPS operating aboard, an almost exact position could be transmitted to those offering help. Vessels needing assistance that were without the ability to give their position via GPS or Loran had to depend upon a combination of describing objects nearby or hope those responding would have radio direction finding equipment. The RDF’s gave operators the direction a signal was transmitting from but the direction was as the crow flies. It did not show water depths between the transmitter and receiver nor could it specify distances. The position of the distressed vessel was often still unknown. Following a direction finder signal while a rescue vessel was underway called for operating at reduced speed unless the coxswain knew the area very well. As boating advanced into the 80’s a greater number of vessels cruised the nations waterways. The Coast Guard or any rescue vessel was still handicapped when attempting to locate a distressed caller unless their vessel had a GPS aboard and they gave their position on their first call for help. If there was only one chance to place a distress call (i.e. : vessel sinking), the responder would have great difficulty locating it without a GPS position. 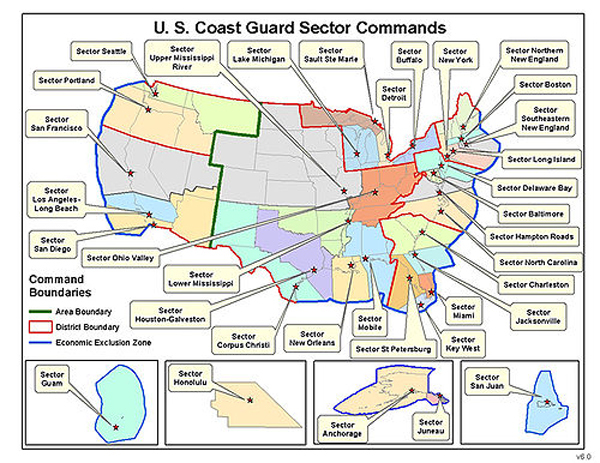 As the 21st Century began, after years of research and studies, the Coast Guard determined there was a need for a new system for search and rescue. A satellite system in conjunction with GPS would be the best option and after a bidding process, General Dynamics C4 of Arizona was selected to design it. It was to be compatible with digital selective calling (DSC). When an operator flips a switch on a properly installed DSC equipped transmitter, a MAYDAY call is sent giving the vessels position, identification and nature of distress. This will make rescues of DSC equipped vessels much easier because they are installed with GPS connections and MMSI (Maritime Mobil Service Identity). A characteristic of a DSC radio is after an operator places a MAYDAY, the call will be repeated. This repeat ability built into the system will allow those in need of assistance to leave the transmitting radio and attempt to correct an emergency, or if necessary, abandon ship. The Rescue 21 system development will improve the Coast Guards direction finding capabilities for DSC and non-DSC equipped vessels. It will operate with multiple receiving towers in conjunction with satellite connections and multiple antenna sites. Strategic placement of towers for Rescue 21 will allow a radio watchstander to not only hear a call but also be able to determine the position of its origin via multiple towers triangulating the location. This coverage is expected to be within two degrees of accuracy. Incoming calls, once pinpointed with multiple signals, should be shown within seven tenths of a mile.